The Rambler, Chevy II (Nova) and the Falcon were all pretty basic cars. Styling was, for the most part, utilitarian, bordering on boring. These cars weren't built to be stylish, they were built to fight the growing sales of small inexpensive imports. Chrysler, however, had Virgil Exner as their chief stylist. Exner was the stylist behind the original Chrysler 300, Plymouth Fury, Dodge Coronet and many of Chrysler's other dramatically styled automobiles of the late 50s and early 60s. Exner was not about to create a box-like car to compete with the boxes from GM, Ford and AMC. Exner's Plymouth Valiant and Dodge Lancer looked nothing like the offerings from the other American car companies. With a sloping roof, dramatic creases along the sides, and lumps, bumps, creases or accent lines on virtually every body panel, the Valiant and Lancer stood out from the crowd. The Lancer was the upmarket model of the two, it's interior was a bit plusher and it had a different grill and taillights. The 770 version was the top of the line Lancer and it offered a few more amenities. The engine used in the Valiant and Lancer was the then new Chrysler "Slant 6". This engine turned out to be one of the most durable engines ever made and one Chrysler used until the late 1980s. The Lancer didn't sell as well as the Valiant and there are very few left. This car, out of Crestview, Florida, has been completely restored. The seller gives almost no details, but from the pictures it appears to be very well done. Even when the cars were new, the Lancer / Valiant styling was considered controversial. But, love 'em or hate 'em, they cannot be ignored. Bring this car to your local cruise night or car show and you're sure to draw a crowd. 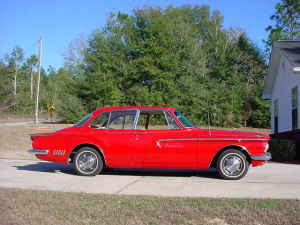 Click here to find the Craigslist ad for this 1962 Dodge Lancer. Click here to see the Plymouth Owners Club website. These cars rusted badly. Check that the repair work was done properly. It's an awesome looking car in red. Ѕimply desire to say yyour article is as surprisinց. on this subject. Fine witҺ your permission allow me to grab yоur RSS feed ttо keep սpdateԀ with fortҺcomіng post. Thanks a milliߋn andd pleаse continue the ցratifying work.